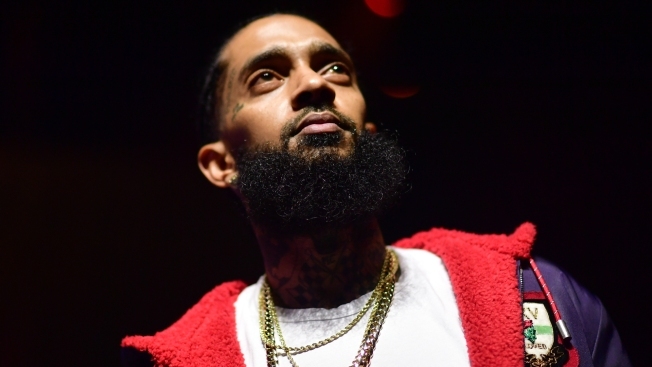 Musicians, athletes, and a handful of other artists are coming out in full force to mourn the sudden death of Nipsey Hussle. The Grammy-nominated rapper was shot and killed outside of his store called The Marathon Clothing in South Los Angeles on Sunday. The Los Angeles Police Department tweeted on Sunday afternoon, "At approximately 3:20 pm there was a shooting reported in the area of Slauson Ave and Crenshaw Blvd. 3 victims were transported to a local hospital where one was pronounced deceased. We have no suspect info at this time and will provide more details as they become available." Hussle's store is located at the intersection of Slauson and Crenshaw. LAPD tweeted on Sunday evening that they are searching for a suspect. "UPDATE: The suspect in the shooting is described as a male black &LAPD South Bureau Homicide is conducting an investigation to locate him and anyone else involved," the police department tweeted. "You can expect the area of Slauson &Crenshaw to be impacted by streets closures &heavy traffic for several hours." The 33-year-old rapper's death sent shock waves through the community and around the world. Many stars, including Meek Mill, Rihanna, Drake, LeBron James and Jada Pinkett Smith have taken to social media to write about what Hussle meant to them and his impact on their lives. The "God's Plan" rapper posted an up-close photo of Hussle rapping into a microphone and grieved about his sudden death. "F--k. My whole energy is just at a low right now hearing this. We just linked for the first time in years and said we were gonna do a new song this summer cause it had been too long," Drake captioned the picture. "You were having the best run and I was so happy watching from distance." Drake went on to write that "nobody ever talks down on your name you were a real one to your people and to the rest of us." Drake said that he viewed Hussle as "a man of respect." Rihanna shared similar words and posted a photo of Hussle with his daughter Emani Asghedom, who accompanied him to the 2019 Grammys, as well as a picture of Hussle and his girlfriend Lauren London from a GQ photo shoot and article. "This doesn't make any sense! My spirit is shaken by this!" the Fenty owner wrote on Instagram. "Dear God may His spirit Rest In Peace and May You grant divine comfort to all his loved ones! I'm so sorry this happened to you @nipseyhussle." Jada Pinkett Smith wrote some eloquent words as she normally does. "Rest in Love Nipsey. I am an admirer of your wisdom which will now be part of your legacy," she opined. "My heart bleeds for all those who love him. Stay strong @laurenlondon. He's an angel on your shoulder now." Hussle's close friend DJ Khaled called the loss "so sad" and the rapper a "great man." "You were an inspiration to the whole world," he wrote. Hussle frequently posted photos with DJ Khaled on his own Instagram page as well. Ludacris shared a photo of the two of them and said, "hip hop has lost one of their elite." Many people posted videos on Twitter of crowds that gathered around Hussle's store in Los Angeles in order to pay respects and mourn him.